And with the new Daredevil series from Netflix hitting soon, I thought it appropriate to look at some of Hornhead's seminal comic stories. 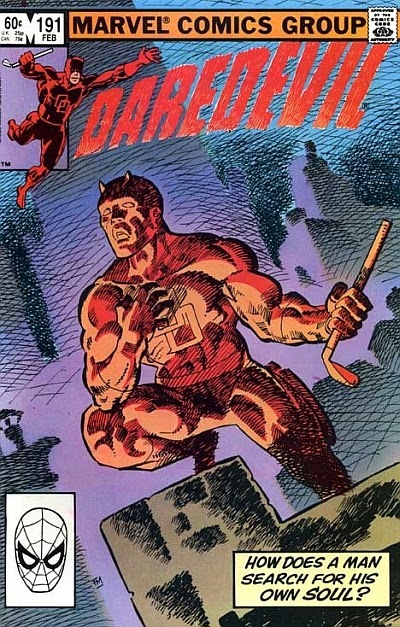 The final issue of Frank Miller’s first run on Daredevil – the run that put Miller on the map and made Daredevil relevant again (if, for argument’s sake, he’d been truly relevant before). Having finally come to terms with the fact that Elektra, his one true love, is dead, Matt Murdock visits her killer, Bullseye. 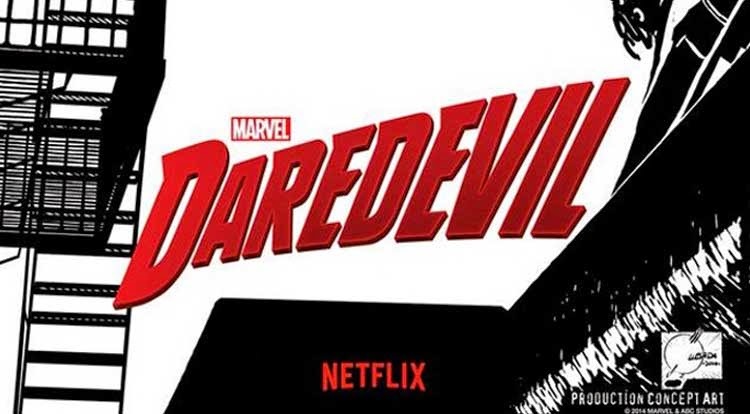 Paralyzed, in a hospital bed, unable to defend himself, Bullseye is forced to play a game of Russian Roulette with Daredevil, as DD ruminates on the hell his life has become, each click of an empty chamber moving them closer to a final, fatal end. It’s a powerful issue – the issue that stands out most, to me, from Miller’s seminal run, even with Elektra’s death in #181 – made all the more significant with Miller returning to full pencils and inked by Terry Austin rather than Klaus Janson, whose work graced the rest of Miller’s run. 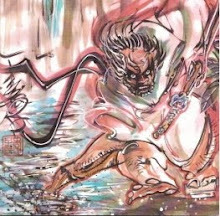 Austin’s inks lend a weight and atmosphere to this story that might have been lost in the more graceful brushstrokes of Janson. It is an intense story that melds art and narrative wonderfully, all happening in a darkened hospital room with a paralyzed villain (and, one could argue, a mentally paralyzed hero), wherein no “action” actually occurs. 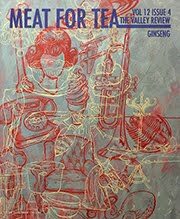 Great issue. 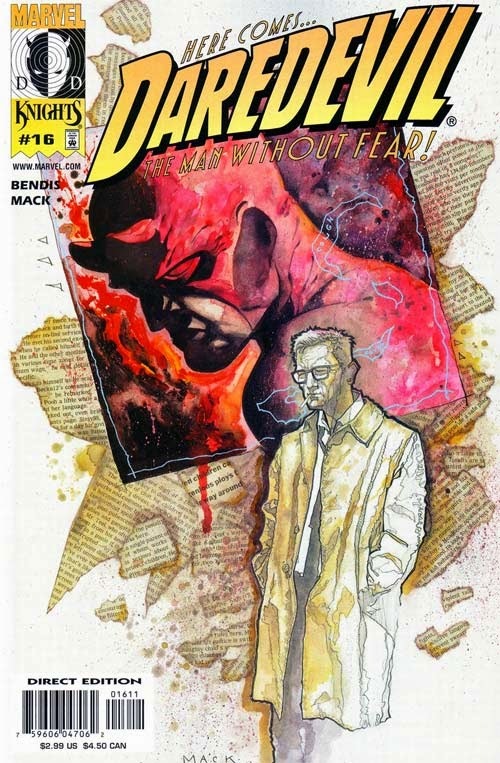 Issues 16-19 of the Marvel Knights reboot, this was the debut of Bendis writing the character that propelled him to the “top of the heap.” This four-part story follows a young boy, the son of a D-list villain, Leap-Frog, and examines how he deals with the trauma of watching his dad beaten by Daredevil on TV. 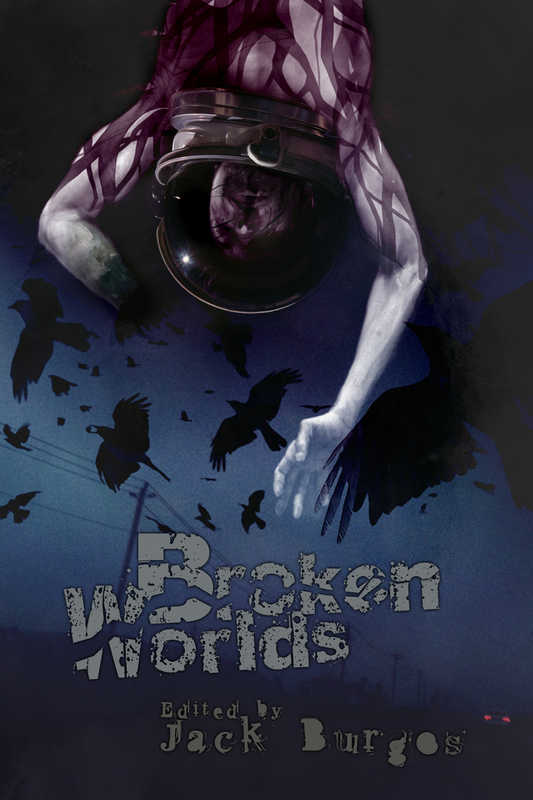 It’s a heartbreaking tale, made more poignant by the lush artwork of Mack, whose mixed media art is always beautiful. With spot work from Joe Quesada – delineating the action fantasies of the young boy – this story has it all: pathos, superheroes, supervillains, mystery, action, and an ending that will tug at your heartstrings. I was introduced to Daredevil through the Nocenti/JRJr/Williamson run, which began a bit before issue 250 of the original series. Throughout this run, Mephisto and his creation, Blackheart, were ever present on the fringes of Daredevil’s world, occasionally becoming directly involved with ol’ Hornhead. Eventually, though, Daredevil realizes he must take the fight to Mephisto, and he enters hell to do battle with the dark lord of that realm. This story is at times deep and thoughtful, and at others quirky and whimsical, a hallmark of Nocenti’s writing style. 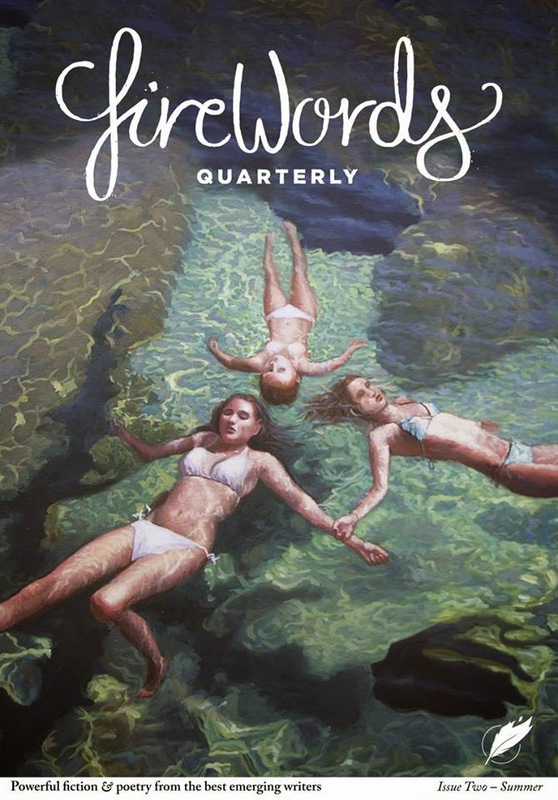 She did things, narratively within a comic, a decade or more before other prominent writers would – and it is fantastic. 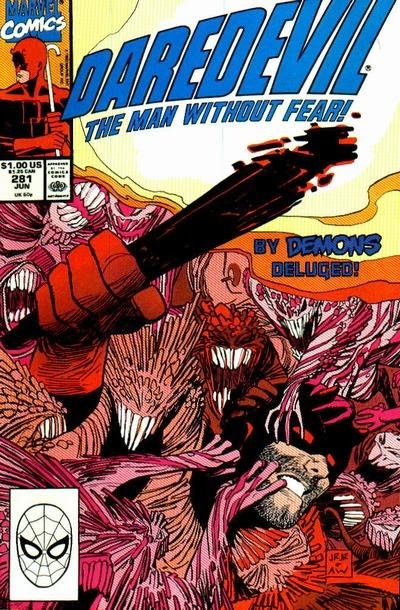 Battling through hordes of demons, Daredevil is relentless and unforgiving, eventually coming to the end of his rope (a theme that reverberates throughout DD’s history as a character). But, at the point where all seems lost, Daredevil has a revelation – in order for there to be a fight, or a battle, there must be two sides contending with one another. If you stop fighting…the fight is over. Sure, that’s a hokey idea, and not one that would help you in real life. But this isn’t real life, this is comics, and Nocenti, et al. understand this very well. 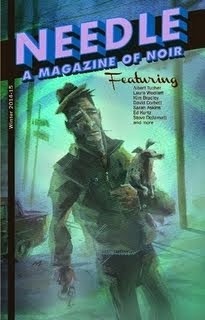 One of my favorite stories ever. 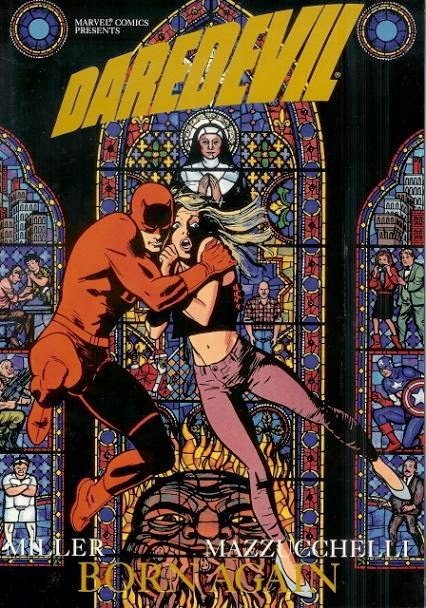 Daredevil versus the Kingpin, with Vanessa Fisk, the Kingpin’s wife, stuck in the middle. 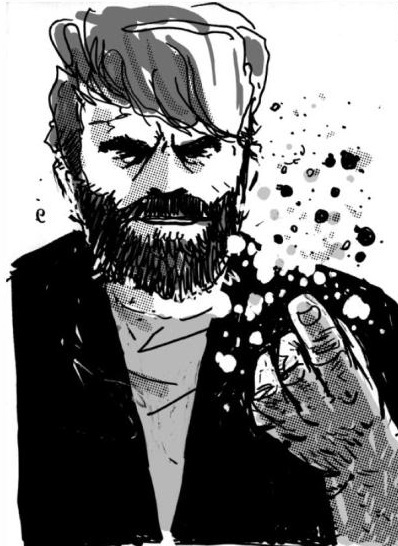 With some of the most beautiful art to grace a comic, this short story also includes one of the most heartbreaking scenes I’ve read in a comic, and it relates to the dashed hopes of the Kingpin – no simple feat. Sienkiewicz brings his signature style to bear, veering into the impressionistic at times, particularly with the Kingpin, in a way that better defines characters rather than muddling the narrative. Published in 1986, arguably Miller’s peak, this is one that has stuck with me for a long time. My favorite superhero story of all time, bar none. In his first run, Miller helped pull Daredevil out of the camp of previous decades into a grittier, if still whimsical, present of 1979. With Born Again, Miller, along with Mazzucchelli, dragged DD into the gutters of Hell’s Kitchen and left the whimsy behind. 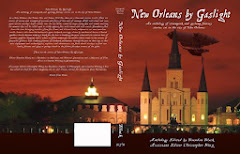 A classic story of a hero brought low by those who love him and left for dead, only to extricate himself and return to rediscover his purpose. At its core, this certainly is an old story. But in its telling, Miller & Mazzucchelli transcend the comic medium with a tour-de-force collaboration nearly unmatched in “cape comics,” while providing a narrative that could rest its spine next to Chandler and Hammett. Sure, I’m biased, but it’s just that good. And the art by Mazzucchelli is some of the most beautiful, traditional linework to be found in a comic, ever. His art is uncluttered, elegant in a way that lends itself well to Daredevil’s martial arts training, while infused with a cartoonish approach that enhances the story in subtle ways. I love this book and re-read it on a regular basis. 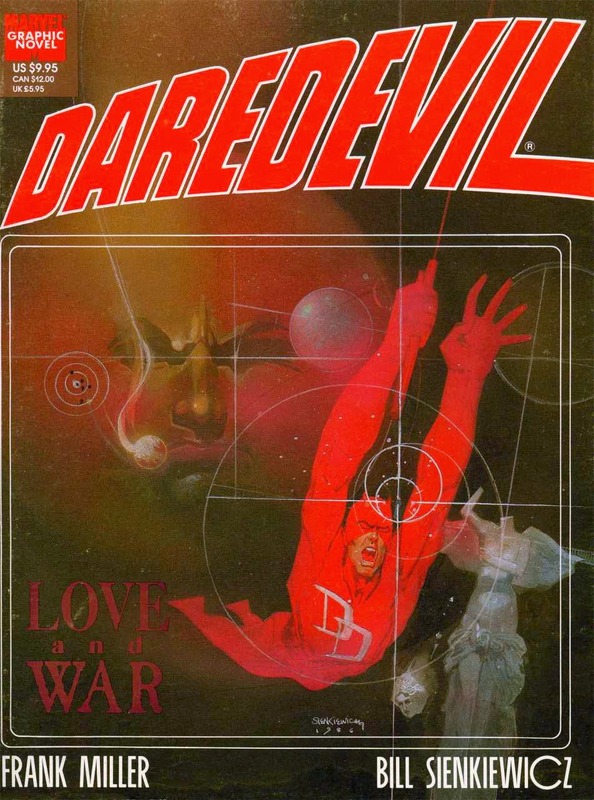 If you need one Daredevil story to familiarize yourself with the character, this is the one.